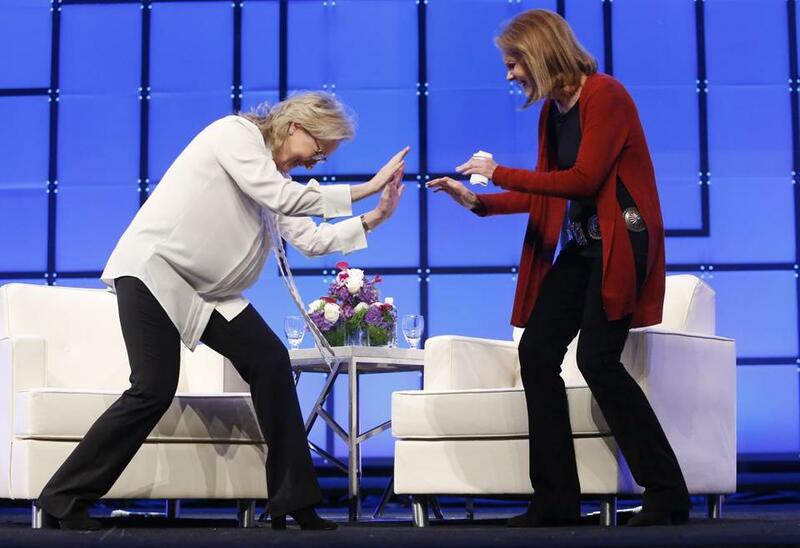 Meryl Streep (left) jokingly bowed down to Gloria Steinem as they arrived to speak at the Massachusetts Conference for Women. The topic of sexual harassment was not officially on the agenda at the Massachusetts Conference for Women, but it was on the minds of many of the 12,000 attendees who flocked to the Boston Convention & Exhibition Center on Thursday. Even as they met at the largest women’s conference in the nation, Democratic Senator Al Franken was announcing he would resign following allegations of sexual misconduct. The day before, Time magazine had unveiled the “silence breakers” who spoke up about sexual harassment as its “person of the year,” and The New York Times published a damning report on the widespread coverup surrounding Harvey Weinstein’s sexual misdeeds. The special election for the Alabama Senate seat involving Republican candidate Roy Moore, who has been accused of making sexual advances on teenage girls, is days away. Conference organizers pointed out that while there weren’t specific sessions with “sexual harassment” in the title, the subject was addressed at dozens of workshops and panels, which had been planned months earlier. And the issue was certainly in the air. “Feminism is fashionable again,” designer Diane Von Furstenberg said during her lunchtime talk. Actress Meryl Streep and activist Gloria Steinem discussed the #MeToo moments that are surfacing across the country during a free-flowing discussion that touched on gender fluidity, President Trump, and women’s representation on corporate boards. When Steinem mentioned casting directors asking if an actress is “[expletive]-able,” Streep replied that, just the night before, a female executive in Los Angeles mentioned that she had been in a meeting this year in which that very word had come up. Awareness has increased exponentially in recent months, but simply removing alleged harassers from their jobs is not enough, they said. Julie McGuinness, who works in finance at the Cambridge biotech company Biogen, is frustrated that claims of sexual harassment are not being investigated more thoroughly, and people never find out what actually happened. “The accusation comes up and they’re just fired,” she said. Corporate response is also lacking, said Zalis, of the Female Quotient, who said in an interview that she had yet to see a company come out with a comprehensive plan to prevent sexual harassment. More than just removing offenders and conducting obligatory sexual harassment prevention trainings, she said, it’s about creating a culture of respect, collaboration, empathy, and transparency. Another panelist, leadership expert Erica Dhawan, sees this as a defining moment for millennial women. Getting men involved is key, she said, as is making sure they don’t go in the opposite direction and stop interacting with women at work. “I wish that in the future, 50 percent of the audience here was men,” she said of the conference. Organizers didn’t track the share of men and women at the conference but acknowledged few men attended. Michelle Beiter and Kate Perruzzi, tech editors at the Norwood semiconductor company Analog Devices, were disappointed by a workshop they attended called “Navigating Office Politics . . . and Difficult People” because the speaker failed to mention either sexual harassment or gender bias. The women were also disappointed that none of the other sessions officially addressed the issues either. Krista Celia was at the conference to drop off her daughter, Alex, an 18-year-old senior at Somerset Berkley Regional High School. Alex just started a chapter of the Girl Up feminist club at her high school, Celia said, and now the local middle school is starting a chapter, too. “It’s a little spark that’s growing,” she said.